Turon (Spanish: turrón), also known as Banana Lumpia, is a Philippine snack made of thinly sliced bananas (preferably Saba or Cardaba bananas) and a slice of jackfruit, dusted with brown sugar, rolled in spring roll wrapper and fried. Other fillings can also be used, including sweet potato, mango, cheddar cheese, jackfruit, and coconut. In the city of Malabon, "turron" refers to a fried lumpia-wrapper-enveloped dessert which has a sweet mung bean filling, while "valencia" refers to the banana version normally associated with the term turron. 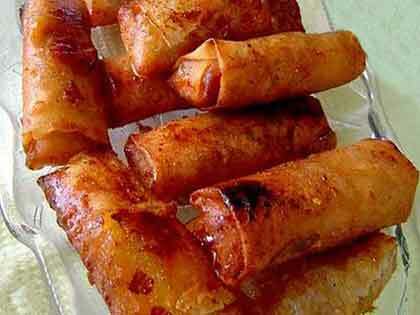 Turon is a popular street food among Filipinos. They can be usually seen on the streets along with banana cue, camote cue, and maruya being peddled by vendors.